The cue has not been inspected or approved by anyone associated with Ed Dames or LearnRV.com, but is a simple modification of one of the practice cues suggested on DVD-3. 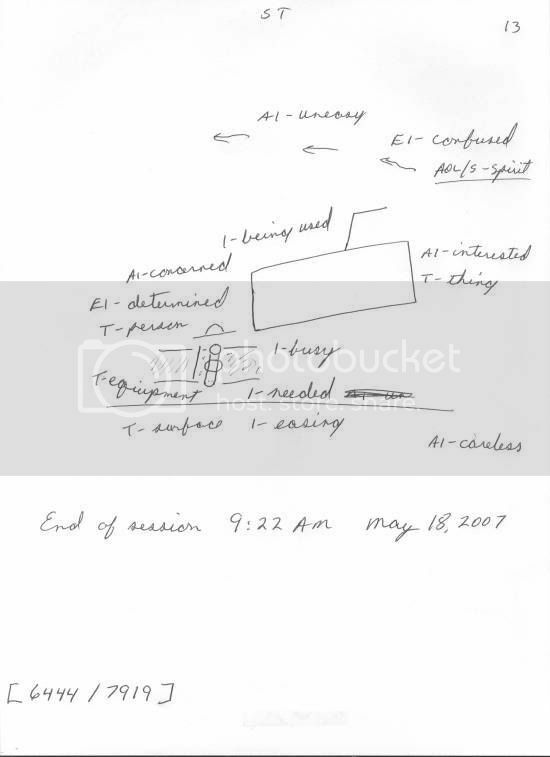 The TRN and cue are written on a 3x5 index card in an envelope marked with the TRN. The envelope is in a drawer of my filing cabinet. There will be photgraphic feedback. Cue and feedback will be revealed when at least 4 people have posted Site Templates. The TRN and cue are written on a 3x5 index card in an envelope marked with the TRN. The envelope is in a drawer of my filing cabinet. No reference material was used in preparing the cue, but there will be photgraphic feedback. The suggested experiment with times, dates and numbers is interesting. However, if the photograph is not included as Target Reference Material in the envelope with the written cue, it has no place as feedback. This will only further confuse the unconscious mind which is attempting to clarify just what it is sensing through practice and accurate feedback. Cuing is obviously a major problem for most RV students, as we can see here. I continue to be amazed at how many people want to change the protocols. I'll participate and see how it goes. Always up for expirimenting. Gee, Cosimo. You ought to know the difference between target reference material and feedback by now. Since you're wrong about that, I wonder what else you're wrong about? MultLnV, welcome aboard. I hope we learn something useful. You are mistaken. With the type of target you discussed above, Target Reference Material and feedback are the same thing or it’s not RV. 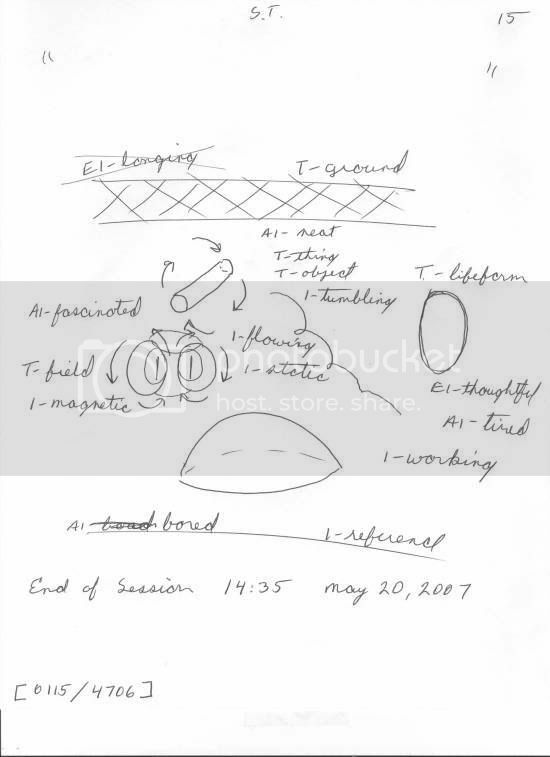 The TRN and cue are written on a 3x5 index card in an envelope marked with the TRN. The envelope is in a drawer of my filing cabinet. There will be photgraphic feedback. While editing is good, I hope you have recued this target with the proper chain of custody and with new TRNs as well. Otherwise fellow students are in for a colossal waste of time. Well, well. A waste of time? Interesting statement. This is an experiment. There is a possibility that the cue is completely invalid. If one or more of the participants hits the target, the experiment succeeds by indicating that the cueing technique may be valid. In this case, no one will have wasted their time. We will have collected important data. Likewise, if nobody hits the target, the experiment succeeds by indicating that the cueing technique may be invalid. And in this case also, no one will have wasted their time. We will have collected important data. While it may be possible that all participants might miss the target even if the cue is valid, or that someone might hit the target even if the cue is invalid, the only way the experiment can really fail is if nobody participates. In that case I am the only one who has wasted his time. Cosimo's previous post seems aimed at producing just exactly this failure by discouraging the participation of willing viewers. Congratulations, cosimo. Whatever your motive, in my judgement you have succeeded in poisoning this experiment, or at least this target in the series. In order to save the experiment I am willing to put all my cards on the table. I will explain the purpose of the experiment. I will reveal the cue for [7197/9887] and explain how the cue was derived. I will reveal the feedback photo and explain why it is feedback and not target reference. I'll explain why I edited my first post. Then I'll propose a new experimental cue, as well as a control cue, right out in the open where everyone can see the process, and we can all discuss the suitability of the cue. The purpose of this target was to produce data indicating whether or not a written date can be successfully used as a temporal qualifier in a valid cue. I chose a suggested practice cue from DVD-3 as the base cue and modified it. I placed the card in the envelope without any target reference material. As cosimo noted, I commented on this in my original post, then edited the statement out. I did this because the words "target reference" appear on the card as part of the cue, and I felt that might confuse people who didn't quite understand the meanings of "feedback" and "target reference" material. It seems I was right, but I probably should have left it as it was. My apologies for the additional opportunity for confusion that my edit allowed. I hope I've answered all of your questions. Please post STs for [6444/7919] before Sunday, May 21, and post STs for [0115/4706] on Sunday, the same day that you run the session. Please make sure that the TRNs used and the session end time and date are visible on the ST. I will post a photo of the front page of the paper by Monday afternoon, May 22. Interesting experiment. I am almost positive this will not work. But I have, on rare occasion, been wrong. I can see now why you would not have target reference material in the envelope. 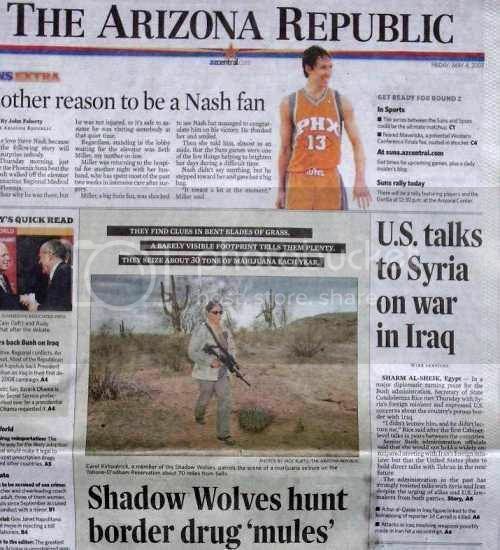 I might try this experiment with the Arizona Republic as well, since I also live in the Valley of the Sun. However, I would only trust data that I did in the blind. I could not objectively participate in this target front loaded. So I will have to make the temporal qualifier far enough ahead to make sure I get to it in my blind target pool. My pool is large right now and I do only one target a day (at best). I will put the temporal qualifier at the end of the cue, as I think that has the best chance of success. If YOU don't believe it works, your conscious mind will probably never allow it to work for YOU. A self fulfilling prophecy, as it were. Conscious beliefs have very little, if anything, to do with Remote Viewing. As long as the Viewer sticks to protocol, they will get accurate data. If someone is prejudiced against something, as I am about this temporal qualifier, there is any easy way to get around that: the blind target. Your conscious mind cannot interfere with the data when it doesn’t know what the target is. That is the wonderful thing about Remote Viewing. I can’t tell you how many times I have been convinced I knew about something or someone only to be humbled by the devastatingly clear RV data. The protocols allow us to stay detached and objective. And that is what sets Remote Viewers apart from the Soothsayers. Im in. Can we create a new thread that is not so glarinly frontloaded? At least I can fool my conscious mind into not knowing what the target is. Strictly speaking, we have not talked about the target at all. As the Major points out in this thread, the range of possible targets is so wide that it really is only pseudo-frontloaded. The only thing you really know about the target is that it might be associated with a newsworthy event. But then again, it is the Arizona Republic, so it might not have any newsworthy content at all. Remember: The newspaper is NOT the target. It is only the place where the photo will appear that our mind will use for target reference. The target is a complete unknown at this time. Chartless, do you care if I do two sessions on this and post both? If my data is bad it might be me and not the cue's fault you know? I hope the scans aren't to big. Since this is an important expirment I think I should post my freehand sketch too. oops wrong date it's 5 / 9 I fixed it on paper just not the scan. 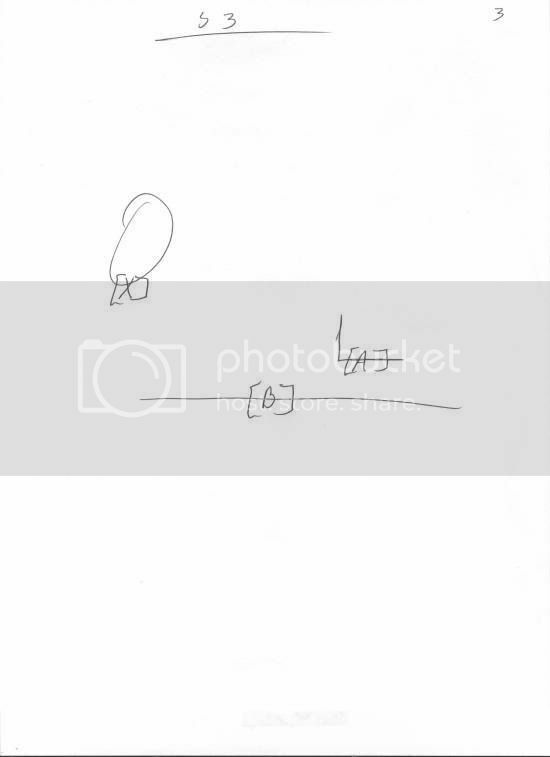 Also I signed my name but marked it out on scan. the S4.5 says "Range like open land, vast. I have the world people on the right side of my ST. but im not sure where it goe. I error trapped ' Docks'. I have people, an event, structures, a spiral staircase, housing, concept of facination and outdoors. Last edited by MultiLnV on Fri May 11, 2007 11:55 am, edited 2 times in total. You can run [6444/7919] as many times as you want and post them all. Just remember that [0115/4706] has to be run and posted on Sunday, May 21 to be valid. Good news, I got my session done for [ 6444 / 7919 ]. Bad news, apparently I don't know how to read a calendar. I just got a PM from MultiLnV pointing out that Monday is May 21. As you can see above, I wrote the cue for [ 6444 / 7919 ] with a day and date that don't match. If that doesn't invalidate the cue I don't know what would. For anyone who isn't thoroughly disgusted with me yet, here is my last ditch effort on this experiment. Please note the day and date correspond properly in this new cue, unlike the day and date in the cue for [ 6444 / 7919 ]. MultiLnV-thank you for finding this error. If the matrix does not recognize dates and time, then how is it possible that this cue will work? I'll do the new target asap, We still need to do [ 0115 / 4706 ] Sunday right? Vintech, I believe that's what this experiment is about to test and see if we can get accurate data or not. 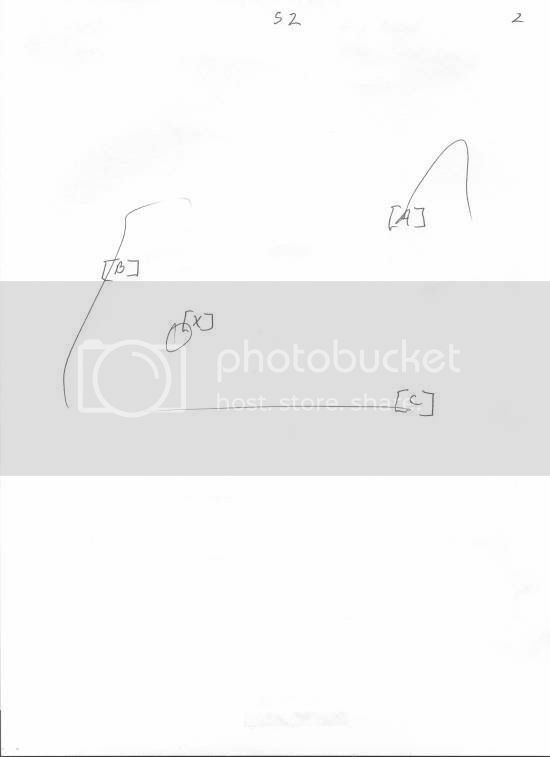 On one of my analytical sketches I Aol'ed field goal post. In an S4 I got the AOL of that again, and after that I got the impression of large men so during my Error trapping I realize Large men probably meant football players because of that AOL. I didn't trust it so I error trapped Large men, Inside with EI: Of Strong, Happy and excited. However, the EI: open to new experiences I do trust. I forgot to label it on my ST, I will go back and do that. I'll be gone for the [Canadian long] weekend, so I guess I'll be left out of this round unless the target can be pushed back a day or two. RVRobot -- I can hold off posting the feedback for a few days if you'd like. No problem there. Vintech -- MultiLnV is right. The whole point of this experiment is to develop some evidence one way or another about the value, or lack of value, of using a date in a cue. There is a possibility the cue is bogus. Time is slippery. Why don't you give this cue a shot? Even if this cueing technique works for one person in a million, you'll never know if it works for you if you don't try it. As usual, i have no idea what I'm looking at. Nice ST Chartless, I'm curious as to how my data goes with yours. Should we explore an element or two and see exactly what we have? oddly enough, I see a couple similar items between your old ST and your new. I don't want to get side tracked on this. The whole purpose of this experiment is to see if there is any value in using a date in the written cue. 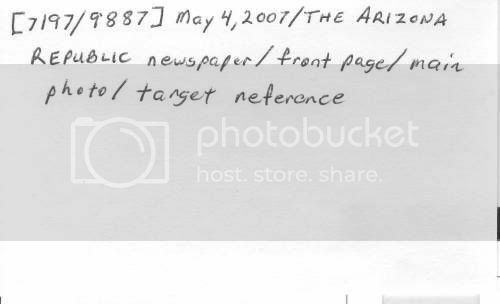 I'm hoping that exploring elements will not be necessary -- when I open tomorrow's AZ Republic to the front page it will point us to a target that matches or doesn't match the STs. I'm really looking forward to getting the paper tomaorrow! Some of this AOL/S should have been Intangibles most likely. I think I blew this target. There's a structure / building here part of it appears to be loose. there's a fragrance here of some kind. ( Note all of the following AOL/S werent for the same aspect by the way) AOL/S Newly reformed AOL/S Monument AOL/S Built in 1803, AOL/S Seven, S4.5 Structure with a circular bottom I perceived vibration along with this structure. There's emotions at this site, but no visible lifeforms, curious, alive, happy, charismatic, joyful, resentment (AOL/S protest should have been AOL, I wrote it backwards on my ST by mistake) The structure appears to be colorful. There maybe plants in or around this structure. I error trapped Mercury, traffic, and abide by the law. Chartless, not that I care but it looks like your S3 says S2, thats a mistake? And actually I do see similar things in both of your ST's. I also see common things in both of mine. However, I see very few things in common between you and I. I think we grabbed different perspectives is all. Yours reminds me of construction, both of them. You are correct, MultLnV. 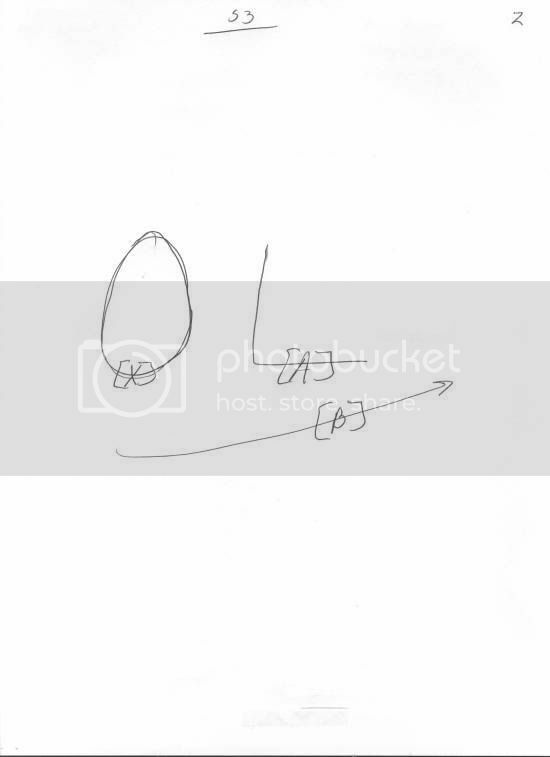 My S3 Freehand Sketch is, in fact, labeled S2. One more pathetic structural error by the goat-boy. Egads. I have seen today's AZ Republic newspaper and prepared feedback photos. I won't say anything more about it until we hear from RVRobot.